Those Below is the second half of a duology by Daniel Polansky, the sequel to his rather good Those Above, which I talked about at length a little while ago. It seems like the focus is on the Roost this time around – the citadel of the effectively immortal, thoroughly inhuman Those Above. But where the last volume showed us the Roost as a calcified, stratified society, ruled by fear and indifference, here the roots of that society are being gnawed away. There’s a sense of seething rebellion as the text opens, a claustrophobic, overheated rage, which is looking for direction. Polansky gives the reader a world one misplaced word away from explosive violence – and then shows us the individuals happy to use more than just one word. The emotional atmosphere is masterfully drawn, but it’s only part of the whole. The Roost is a thoroughly unpleasant society, one where all the power resides in Those Above. It’s a society where those who enforce the laws have no part in them, where even the most effective human administrators are regarded as pets. It’s a society where the few have not only turned their backs upon the many, but don’t even see them as worthy of attention at all. It’s something almost beyond feudal – though there are some interesting comparisons drawn between the top-heavy society of Those Above and the governmental structures of the nations around them. Whilst the society as shown is untenable, the question of whether anything would improve if it were torn down is one which surfaces throughout the text – the growing sense of revolution perhaps tempered with the knowledge that any successor government, whilst human, might be no less uncaring. At any rate, Polansky brings the Roost to a bright, jewelled, horrifying kind of life. Outside of it, the Aelurian army continues on the march. Bas and his gang of hard-edged misfits prosecuting a war orchestrated by their senate – and of course, the machinations of our favourite aristocrat from the previous book. We get to see some of the melancholia in Bas’s character here. His curious relationship with the Seneschal of Those Above tasked to keep an eye on him is affecting and tragic. In a book filled with cultural divides, their interactions seem the closest anyone comes to a genuine bridge – and even then, the metaphorical bridge is, at the very least, on fire. He’s still cold and clinical, a man inside of himself – but there’s enough chinks in the armour to give us something of the reserved character behind the mask, and that’s great – and makes his trudging through mud, cold and the occasional siege far more interesting. The rebellion continues to gather pace in the Roost. Thistle, now renamed Pyre, is at the forefront. Having watched the shaping of a zealot in the first volume, his shifts in character here are built on that foundation. Pyre is a man filled with righteousness and faith, called upon to do some fairly ugly things. His certainty takes a few knocks over the course of the book, and watching him tie ambiguous strands of character into his existing net of truths is fascinating. If Thistle became Pyre in Those Above, then Those Below takes Pyre on the journey into becoming something more – though wondering what the consequences will be. There’s a delightful set of scheming and verbal knives from both our Aelurian aristocrat and the seneschal for one of Those Above. Watching those two spar is a delight, and the competent naiveté of the one, and the obfuscated brutality of the schemes from the other, are page-turningly compelling. Both are charming – though the Aelurian more for the laser-like focus of an extensively talented and utterly amoral mind, the Roost-born for her efforts to close some of the gaps between humanity and Those Above, whilst remaining something of an everywoman. In each case, they proved rather hard to put down. The plot – well, as ever, no spoilers. Still, it would be fair to say that this is a book which starts on the cusp of violence, with rebellion on the boil. There’s some heart-hammeringly good action here, mixed in with a soupcon of politics, and discussion of social structures. It builds on the momentum of the previous book, and gradually, inevitably, cascades a boulder mixed of madness and brilliance down the narrative mountainside. Is it worth reading? You’d need to have read Those Above to really appreciate it, I think. But it’s a more than worthy sequel to that predecessor, one which promises a great deal, and viciously, nihilistically, cleverly, artfully delivers. So yes, give it a read. Beyond The Aquila Rift is a collection of short stories from acclaimed sci-fi author Alastair Reynolds. I’ve seen a couple of these stories in collections before, but there’s quite a few which have not been previously collected (and I’ll put a table of contents at the end, in case that helps). So, let’s talk about the worlds on display here. Constructing a universe on a grand scale has always been a strength for Reynolds, and the imaginative talent on display here is, if I’m honest, pretty dazzling. There’s explorations of humanity that touch on the cultural, as with the titular story. There’s breath-taking temporal leaps, and feats of stellar engineering so vast as to shatter both expectation and the narrative lens. The broader sweep, across the stories, is of a confident, imaginative writer, bringing the reader into a complex and un-documented playground. That some of the toys may well be lethal is rather beside the point. In amongst his evocations of the wonderful and the terrible, which is done with characteristic élan, Reynolds brings the reader into more intimate focus. The shattered grandeur of Martian terraformers from The Old Man and the Martian Sea is contrasted with the gently poignant relationship between that man and a young woman briefly in his care. In the same vein, the travails of another young woman, in a Newcastle once more locked into an ice-age, are thrown into definition by the thronging, recuperating world around her, as well as intimations of a wider threat. 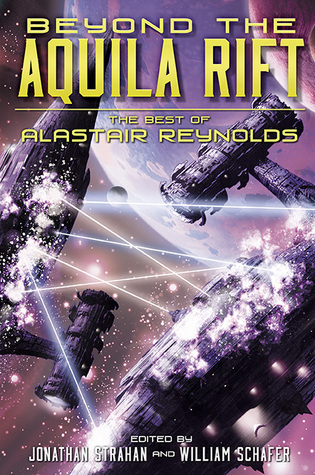 Reynolds has always been able to give us a sweeping vista, as vast as the reader can conceive; these stories combine that with a sense of the familiar, a sense of the human, even when mixed with the infinitely more unknowable, which creates a bond with the reader and makes each story relatable, whilst enhancing the strangeness laced throughout the prose. There’s great range in place here – from enigmatic, claustrophobic puzzle boxes, to a world broken by nuclear fire, to our very near future. Each seems to leap fully-formed from the page, a well-realised idea, stretching the bounds of the imagination. In summary, the world building is top notch. The characters. Well, I’ve spoken well of Reynolds more recent characters, having occasionally felt their predecessors received less attention than the worlds which they inhabited. On some cases, it stills feels like this is the case – the characters driving a plot within a world, but not quite forming part of it themselves. On the other hand, this may well be intentional in some stories, and is entirely absent in others. Minla’s Flowers, for example, is a long, slow study of the way in which two individuals change, and what they are willing to do in pursuit of a goal. That shift, that fluidity and rigidity of character, is constructed with horological precision – and it’s both effective and affecting. The Water Thief is another example – looking at the way character can be hammered into or out of someone by circumstance. Here the question is not around actions, but decisions – when an individual will decide to take a stand. It has a nuanced portrayal of its protagonist, a man on the edge of hope and despair, holding to a notion of himself. There’s other questions of course – the story Fury takes us down the rabbit hole of memory, as does the languid, mildly horrifying Zima Blue. In exploring what makes a sentient a person (and perhaps vice versa), Reynolds does well. As always, I wanted to spend more time with the characters, to know them better, but there was enough meat on their bones to make the characters, as a whole, effective and believable individuals. The plots…well. As ever, no spoilers. But they range from melancholy discussions of the human condition, to tense investigations, to the kind of creeping horror which makes the reader shudder, but turn the next page. There’s deliberation in these pages, ruminations, decisions, and the stakes are high enough, both personally and absolutely, to keep the book in hand. Some rocket along, and some are less frenzied, more considered – but I can’t say the plot of any of them was a disappointment. Is it worth reading? If you’re new to Reynolds, the breadth of talent on display here demands your attention. He has a penchant for the grand and high concept, dovetailed with the personal throughout this collection. If you’re coming to this for your next Reynolds fix, then be assured – it’s as weird, and clever, and awe inspiring as his best work. Definitely give it a try. 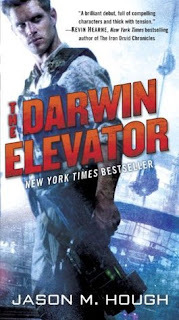 The Darwin Elevator is the first in the Dire Earth Cycle by Jason M. Hough. It’s set fifty years or so after a cataclysmic global event. A plague of some kind turns people into shells of their former selves – filled with rage, and determined to tear apart everything around them. The only sanctuary is in Darwin, Australia. As the plague struck, a small area around Darwin remained mysteriously unaffected, and was used as a last ditch refuge. A space elevator was built there, to push the shattered remnants of humanity into orbit, and away from the insanity and death that waits outside of Darwin’s borders. The world, after the cataclysm, is an eerie place. Much of our time is spent with the leader of a scavenger crew. They hurtle across the globe, touching down in sites of technological or cultural importance, picking up relics for well-paying clients. This ghoulish archaeology has an undertone of sadness and loss, and a slightly louder tone of insidious terror – coming round each corner , one might find a valuable artefact from a forgotten world – or a mindless ravening monstrosity, looking to rend flesh from bone. Hough manages to blend these two moods perfectly – and the melancholia and fear of the scavenger crew pours off the page. Along, it has to be said, with rather a lot of bullets. More on that later. Aside from the broken world, there’s also the surviving city of Darwin. It’s a place constantly teetering on the edge of chaos, keeping the mad hordes away, whilst pushing food up the space elevator to the orbital banks in exchange for tech and materiel. The desperation here is palpable, and the despotically iron control exercised by the city manager, in part for his own aggrandisement, and in part just to keep the society from falling into chaos, is captured well. Darwin isn’t really a place you’d want to spend time if you could help it – but it is vital, alive, and a nice thematic contrast to the broken world outside. In contrast to both is the society up the elevator – the isolated, technological bubble, looking to keep humanity alive, sustain them, and perhaps find a cure for the plague that ended humanity. This is a cooler, more clinical world, one of separation and strict hierarchy, ruled by a council of oligarchs. There’s an arrogance on display, and a feeling, perhaps unearned, of power. Hough manages to keep this third society, those in a bubble, distinct from the brawling, teetering city below, and the hungry, dead land outside. Within this world, we’re following the immune, Skyler Luiken, and his gang of scavengers. Skyler is a champion of self-doubt, a man leading his crew because no-one else will. He’s driven to succeed, but mostly to put bread on the table. The world outside is a source of funds, and it seems like he’d rather not be out there at all. Over the course of the text, Skyler becomes more confident, and gains a certain amount of personal strength and surety – the flow feels organic, his doubts falling away as events require him to combat them alongside more corporeal foes. Still, though we spend a lot of time with him, it feels like there needs to be more – there’s a lot of plot going on, and we learn a lot of Skyler from what he does, but a few more nuanced, reflective moments wouldn’t hurt. Still, he’s a believable protagonist, flawed as he is, and helps keep the narrative grounded. The supporting cast of his crew are perhaps less well rounded. I’d have liked to have seen more of them. They have traits, granted, and we can see them act upon them, and make their own choices – but they feel like foils for Skyler, rather than independent individuals. There’s also a fair bit of time spent with the manager of Darwin – here we see a man gradually succumbing to the sickness of power. He’s not a good man, by any stretch . A believer in strength and cunning deciding what is right, he’s a man forming an army, and trying to keep a city full of people alive. Some of it is more widely helpful, but most of his actions have selfishness at their core, a desire to come out on top in this smaller, meaner world. As a villain, he’s occasionally conflicted, even more occasionally sympathetic, and typically quite worryingly repulsive. The sort of visceral reaction he evokes is a sign of the good work Hough has done in crafting an antagonist – of sorts, at least, if the environment weren’t enough. The plot…well, it starts out looking at the retrieval of old technology. There’s a central mystery too, which is worked on throughout. But to avoid spoilers, all I’ll say is that this is an action packed book. It has an absolutely rip-roaring plot, which never really lets up, and some really well done action sequences. It feels non-stop, each turn of the page bringing another revelation, another reaction, another explosion. It grabs hard, using the setting to leverage into serious action, and doesn’t let go. Is it worth reading? Well, I love the setting, I really do. I’d like to see the characters given more space to grow into themselves, but perhaps that will happen in later books. The whole is a fast-paced piece of enjoyable sci-fi action, and if that’s what you’re in the mood for, I’d recommend it. 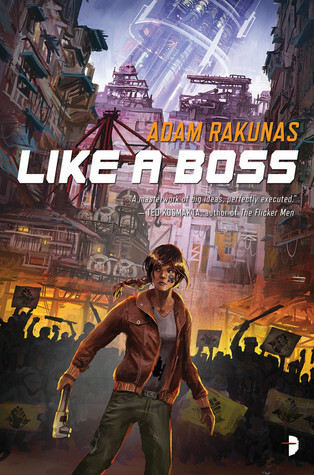 Like A Boss is the sequel to Adam Rakunas’ debut novel, Windswept, which I talked about rather positively last year. We’re back with the inestimable Padma, now splitting her time between running the Old Windswept Distillery and cleaning out the city sewage system, trying to pay off some rather extensive property damage from the previous book. This is a somewhat wiser Padma though; she’s still just as angry, a pot perpetually on the boil, but there’s a sense of burgeoning self-knowledge there as well. Rather than the recruiter of Windswept, keen to make her quota and retire, there’s a more measured, reflective set of responses in Padma now. She’s running the distillery, a boss, and part of the rum-and-cane co-op which seems to server Windswept as a proto-governing body. But she’s working at being a good boss, working on dealing with people as people. This self-discovery continues throughout the text. Padma isn’t just one thing, which is fantastic – she’s not a heroine, or a misanthrope. An arse-kicker or a thinker. An idol or its shattered remains. She’s all of those things, a multifaceted presence, whose weariness pours off the page around a white-hot core of anger and ideals. She may not be perfect, but that rather feels like the point. Padma is an ordinary, if damaged, person, reacting as people do, and trying to make the best of her life. Whether that includes making it better for anyone around her is a matter for debate. I rather liked Padma in Windswept, and it’s great to see more of her here, and see the gradual, organic-feeling shifts in character over the narrative. That she’s highly skilled (but makes mistakes) and acerbic, but mostly doing her best - this sort of well portrayed complexity means that she’s a pleasure to read about. It would have been nice to have a closer view of the supporting cast – there’s a more disparate group than last time, and perhaps a loss of intimacy, compared to the relationships from the first text. This is counterbalanced in some ways by the tighter focus on Padma - it would, however, be great to see more of the supporting cast in any later books. The world – well, we saw rather a lot of Windswept before. There’s some changes here, in a town kept alive by corporate need. After the events of the last novel, the town is having to cope with the fallout. It feels a bit smaller, and perhaps because of that, a bit more intimate. There’s an intriguing dialogue going on between the folk in the city, processing cane, turning it into rum, and so on – and the dwellers in the kampong, those who cut the cane and deliver it. You can feel the social forces in conflict, trying to find a divide or common ground. It’s a subtle undercurrent in a lot of the dialogue between those two groups, and a division which informs their actions as much as that between the folk of the town and those still inside the corporate enclave. Then there’s the divide between the Union bosses and their cohorts in the city. A sense that the union is bifurcated, that it’s becoming more, for want of a better word, corporate, also pervades the text. Padma sits in the middle, moved into the organising committees alongside her distillery ownership, but come from nothing, and still unclogging a lot of rather clogged piping. The unspoken issue of how the union is run, what it’s for, and why that matters, crackles through the page. It’s engaging stuff, approaching complex issues with humour and a refusal to look away from both the bad and the good. To be fair, as with the country and city division, this one is mostly in the subtext, but it did keep me interested, and keep me thinking, which was fantastic. The plot – well, no spoilers here. But Padma’s retirement is, to put it mildly, nowhere near as comfortable as she assumes. There’s an intriguing array of crosses – double, and possibly even triple. Occasionally I had to re-read bits to make sure I was correct about what was going on, and, critically, why it was happening. But having said that, the political intrigue carries an appropriately lethal level of skulduggery, and there’s some beautiful set pieces, from the action-packed to moments of wonderfully tense emotional vulnerability. The story ramps the stakes up gradually, but never seems to stop doing so – and ties the grander global game with a more personal struggle for Padma in a way which makes for an eminently enjoyable read. Is it worth reading? As a follow up to Windswept, I’d say yes – if you missed Padma especially. It’s a cracking read, and I’m looking forward to seeing where Padma and Rakunas take us next. It’s time for another in our ongoing review series of K.J. 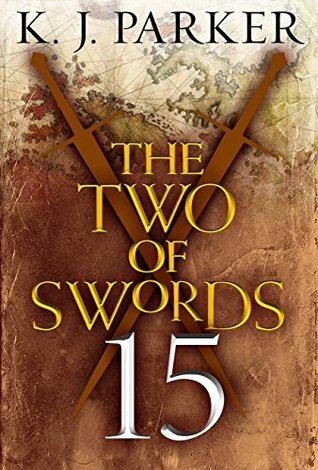 Parker’s serial novel, Two of Swords. We’re up to part fifteen now. It follows on directly from part fourteen, which ended...explosively. An armed man had burst in on our previous protagonist. To the surprise of probably no-one at this point, that man is serving as our protagonist for this chapter – at least mostly, more on that later. There’s a bit of politicking in this segment, and some nice relationships - including some spot on dialogue. The broader picture is at least partially affected, and the readers get to see more of it, which is great. It’s also a section where things get a bit bloody – I’m not sure anyone’s hands are clean by the close. Our new protagonist is a Major in one or the other of the Imperial armies, and has turned up in order to make off with the slightly mysterious woman we caught up with in the last section. Parker manages to draw us his character quickly, and then fill in the detail – a wry, tired man, trying to do what he sees as a hard but necessary job under difficult circumstances. That the job involves mangonels and kidnapping is neither here nor there. It’s an attitude you see in a lot of Parker’s characters – people doing the best job they can, even when the job is an awful one, their efforts to halt the widening spread of chaos met with quite the reverse. Still, there’s layers to the Major. We’re examining the gap between perception and reality, between the three kinds of truth, again. He’s a man happy to claim he’d burn a library, or organise a massacre to get what he needs – and says afterwards, feels afterward, that he wouldn’t have done so. Whether he actually would is another matter, and that ambiguity of character is a real high point of this part of the text. Another is the Major’s relationship with one of his subordinates, and with their newly acquired cargo. The latter is embodied in tense, spiked dialogue. Each dances around the other, and there’s a sense that at least one of them is looking to draw blood – emotional, if not physical. The contrast with the Major’s relationship to his subordinate Captain is clear. There’s a less formal respectful dynamic there, a sense of two people who’ve worked together for a long time. If not banter, then there’s a sort of sly acknowledgment of who and where they are, and the absurdity of their position. Parker manages to spin this friendship out of passing remarks and stray thoughts, and lets the reader fill in the rest – but it works. Geographically, we spend rather a lot of time on the sea. There’s a fair amount of boating, general seasickness, and so on. But there’s also tours to Blemya – allowing the reader to catch up on events there since the queen’s last appearance – and other areas, more mired in the ongoing conflict. As usual, Parker pulls out some rich, imaginative prose that really makes these locations come alive – the creaking claustrophobia of shipboard, the elaborate grandeur of the Blemyan Great Hall, the quiet brooding of the moorlands. It’s a world that’s close enough o our own to be familiar in a lot of ways, and the narrative makes it come alive. For the plot – well, as ever, no spoilers. But there’s rather a lot of blood in this one. And we finally get a view of the purported goals of the Lodge in the war. Or at least some of them. Of course, Two of Swords has been full of misdirection and conflicting agenda’s so far, so it’s possible they aren’t the whole truth. But still, it’s nice to get a sense of the wider picture. The smaller story, of the Major’s journey with his captive and his men, is pleasantly, intimately told, and a thoroughly enjoyable read; though the sense that we’re entering the endgame hovers over the narrative, a brooding stormcloud of promise. At this stage, I suspect you know if you’re invested enough in the series to keep reading it. I will say that this is one of the quieter instalments (bloody parts aside), but one which looks like it could have a strong impact on the larger story as the narrative ramps up – and that made it well worth reading. The Wheel of Osheim is the third in Mark Lawrence’s “Red Queen’s War” series. I’ve spoken rather glowingly about the preceding instalments. It’s nice to be able to say, straight off, that this concluding book does not disappoint. From a character standpoint, the majority of this book is focused on Jalan. After the events of the previous two books, Jalan is moving into conflicted territory. He’s definitely still a man with a highly defined sense of self preservation, but there’s hints of something else underlying that. There’s metal at the core of Jalan, an unyielding strength, usually masked by his cheerful malleability in search of a good life. It’s becoming more prevalent here. There’s still a layer of cunning, and a certain moral flexibility about the man, don’t get me wrong – but also a sense that these are being harnessed into a more cohesive sense of self, driven toward a purpose, rather than as part of a general search for dissolution. Jalan, essentially, has moved from being a man who lies, to one who lies in service of a truth. As a liar, his greatest strength has always been his ability to inform the reader about his own self awareness, and this strong performance continues. Jalan lies a lot, and often to himself, but he’s certainly more honest than one might expect, and even his lies help to shape a different kind of truth for him. It’s great to see this kind of character growth. From spoiled, horrified manchild, to a more composed, slightly less spoiled man, trying his best to stay alive whilst being thrust into roles which try to form him into something greater. The image shapes the man, and the man in question knows this – chafing at and embracing the constraints which are gradually draped over him by the expectations of others. In short, Jalan continues to be complicated. But he’s also wry, witty, and recognisable as the embodiment of a flawed humanity. The reader can empathise with Jalan, feel his fear and follow his decisions, whichever side of the line of heroism they happen to fall upon. Lawrence has given us a protagonist who isn’t a hero, but a man, an individual with needs and fears (quite a few fears) and desires and ambitions. It’s a masterclass in forming an endearing individual out of relatively few redeeming qualities. Like Jalan, never trust him – unless you have to. It’s great to see Jalan;s character shift over the course of the trilogy, and, in the end, to see how he chooses to behave, and why – whether the truth is what he tells himself, or what he does, or something else entirely. He’s no hardened Viking warrior, but definitely something different by the close, an alloy of fear and sense, of responsibility and laziness – in short, he’s terribly, wonderfully individually human, and continues to be a pleasure to read. There’s also some time spent with Snorri, last seen descending into hell in search of his dead family. His journey is perhaps more heroic, in that there’s rather a lot of axe-play and blood everywhere. But it’s filled with the sort of raw emotion, the honest tenderness and pain that Lawrence always manages to make bleed off the page and into the reader’s soul. Snorri is a man looking for something, and his journey towards it will help shape who he is as much as Jalan’s. It’s a quieter trip, in some respects, a low murmur indicating the slow cataclysm of shifting emotional tectonic plates. Snorri’s always been comfortable with his own definition of who he is, but there’s changes here, and a gradual movement towards something new. Admittedly, he’s still hitting things with an axe, but it’s Snorri. Some things will never change. The world – ah, well, I do love the Broken Empire. We’re back in Vermillion, Jalan’s home, for a while. It’s great to see this large city, which we briefly glimpsed in the first book, brought to life. Unusually for the Broken Empire, it’s a thriving metropolis, fileld with everyday people going about their everyday lives, without the threat of brutal murder or political oppression – or at least, no more so than usual. The river sparkles, the trails alongside it sting and squelch beneath the feet – it’s a city with pride. There’s organised gangs again, and nobility with more money than sense, and even more propensity for violence. It’s a city wedded to its future, and absolutely fascinating. That fascination continues, though wedded to the somewhat more macabre, in the work of the Builders – the long vanished instigators of the cataclysm which broke the world in the first place. 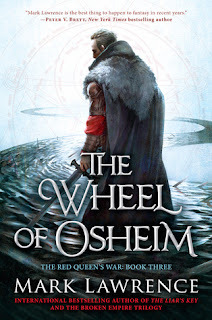 The Wheel of Osheim is one of theirs, a place which we’ve seen able to turn desire – and terror – into reality. It has a greater place here, as one might expect given the book’s title. The ghoulish solemnity of it, and the slowly creeping sense of dread that just the name engenders are both spot on. The Builders may be gone, but their works are wonderful and dreadful to look upon, often both at the same time. If Vermillion is raw energy and avarice, then the Builders works are the scent of old blood and steel. That said, the explorations of their works are as fascinating as ever, and the world as a whole remains a deadly, but vivid and intriguing place. The plot – well, as one might expect from a conclusion, there’s rather a lot going on. I won’t spoil any of it here, but it wouldn’t go too far to say that there’s rather a lot of stabbing, and more than rather a lot of axe work. Jalan and Snorri’s banter gets a serious work out, and the Builders show off a monument to their hubris. It’s all beautifully done. Where there’s action, it’s break-neck and impossible to put down. Where there’s a lull, where characters are learning more about each other and themselves, the narrative has the painful truths embedded in it which make it…impossible to put down. 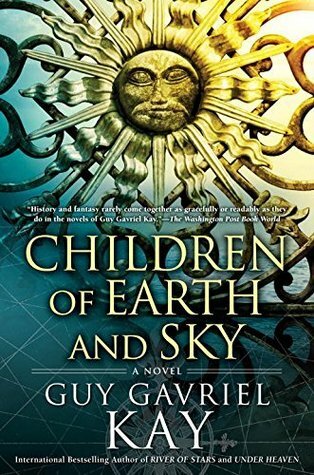 There’s a world painted horrifyingly and beautifully, with complex characters we’ve followed for two books, responding with emotional integrity, to a plot which, frankly, was so compulsive and compelling that at one stage I was eating dinner with one hand and unwilling to stop reading with the other. Lawrence has pulled off a coupe-de-grace, a stunning conclusion to a trilogy which set an already high bar.If you haven’t started the series yet – go and do that. If you’re out there waiting to see if it’s worth reading – don’t hesitate. Go and get a copy right now, and thank me later. As ever with Kay, the characters are absolutely spot on. There’s a diverse, sprawling cast from Ambassadors to urban raiders, Emperors to the sons of merchants. Each of them, however, feels special. Kay is a master of making his characters feel complex, with a rare level of emotional depth and personality which brings them off of the page as living, breathing individuals. The woman who works so hard to become a raider, and lets bonds of loyalty and vengeance move her is as vital and intriguing as the artist, looking to define himself alongside the legacy of his father, sent into perilous circumstances. That each character comes off the page feeling distinct and human is a tribute to Kay’s lyrical, carefully constructed prose. That each character is intricately linked to each of the others, through each other or through the waves of circumstance, only makes the overall picture more impressive. Occasionally it feels like the cast is sprawling a little widely, but they’re typically reined in where necessary – and each has a level of nuance in their character that Kay has always been so good at portraying. Honestly, plot aside, I’d read the book for the characters alone – absorbing, believable, flawed but ultimately, well, people. The world they live in is analogous to near-Mediterranean Europe in the fifteenth century. Sarantium, light of the western world, has fallen to forces from the East. Cultural and political shockwaves are still surging through the surrounding nations, the new status quo threatening to shift delicate balances one way or the other. We get to spend some time in several other large cities before going anywhere near Sarantium; upstart trade republics, raiding cargoes to keep themselves fed, and towering commercial colossi – one a rough parallel to Venice. There’s also space to wander the backroads of the continent, near to forests gradually being felled, and Kay makes each environment feel unique. The cityscapes in particular are vivid examples of urban geography, from the gentle bridges of the alternate Venice, to the broken walls and shattered hippodrome of the renamed Sarantium. The space outside of the cities feels more isolated, perhaps a little magical, but equally terrifying and occasionally lethal. In any event, Lay has conjured a gloriously living world here, one which pours itself off the page and into the imagination of the reader. The plot – well, as seems traditional, it begins in several disparate strands. People making small choices, being directed (or not! ), and setting out to live their lives. Perhaps more than usual, it could be difficult to keep a grip on all the various narrative threads – moving from character to character a little disorienting. But Kay’s careful pacing pays off, as each of the strands ties in to the others, a set of small actors changing the world in the ripples from their own actions – if only changing it for themselves. There’s lost love here, and murder, and individuals looking to define themselves. There’s the question of legacy, and the way individuals relate to their parents. There’s gentle dialogue on the matter of faith, and representations of the same. There’s epic politics occurring in the background of our protagonists lives, and there’s the small (and otherwise) human dramas which make those characters who they are by the end. Is it worth reading? Unreservedly yes. If you’ve read some of Kay’s other work, there’s some delightful references scattered through the text, but if not, the book will work perfectly well. It’s an intriguing, complicated blend of pitch-perfect characters doing the best they can, in a well-realised parallel history, and occasionally changing the world. I couldn’t put it down, and in that spirit, I highly recommend that you pick it up. Saint’s Blood is the third in Sebastien De Castell’s Greatcoats series. The series has always combined razor sharp, witty dialogue with an intriguing setting and characters with emotional honesty of a surprising heft. The previous book was one of my standouts from last year, so my expectations from this follow up were high. 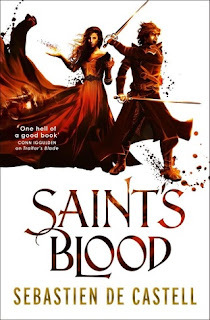 Not to give anything away, Saint’s Blood meets those expectations, then stabs them in the throat with a rapier after kicking them in the knees, before giving a witty one-liner and wandering off. We’re back with Falcio Val Mond and his merry band of Greatcoats in this instalment. Falcio, having survived some esoterically impressive torture earlier, feels like a more fragile figure. His anger, always bubbling away beneath the surface, is starting to break through. He carries some of the symptoms of post-traumatic stress disorder, which are handled tactfully, but unflinchingly in the narrative. This Falcio is one more damaged than before. But the complexities of the character remain in place – he’s influenced, but not defined by his experiences. He also begins to reach out emotionally, though in a more protected way than before. Falcio, a man who occasionally takes outrageous risks, approaches his emotions with the savoir faire of a kitten approaching an IED. De Castell crafts Falcio’s character with precision and skill, leaving us in no doubt that this is a flawed, possibly broken man, driven by anger and a sense of what is right. Falcio’s flaws help make him more human, and his pains leave the reader heartsick in their intensity, and in the emotional truths which they convey. They’re backed up by a similar level of veracity in the supporting cast. Kest, after a strong performance in preceding texts, is shown here worn down, and looking for a new role to play, after fulfilling his last goals. Where Falcio is angry, Kest feels lost, a man searching for a new truth, a new purpose. Brasti…well, he’s still the sad clown, a man fighting back against the harsh realities of the world with a wry witticism and a sharp arrowhead. The interactions between this central trio are, in part, defined by their relationships with others; it’s great to see more of the women in the Greatcoats, taking on key roles and not taking any crap from our dynamic trio. It would be even better to see more of them, of course ; really though, I just want to spend more time with all of these people, dynamically, elegantly, realistically constructed as they are. The world – well, it’s falling apart at the seams again. Where the previous text looked at the role of the Knights, the secular arm of power, here the key theme is faith, and the role of the church. There’s an excellent portrayal of different types of faith here – from Falcio’s firm grasp on the law, through a martial leader with a belief in something larger, to the more concrete grip of prelates on the majority of the populace, and their efforts to shape faith in preferred directions. It’s a nuanced exploration of a complex issue, sitting behind and informing the decisions of the characters. It’s also part of this world that we’ve not really seen before – looking at the intricacies of spirituality in a universe where Saints, minor and major, exist and can be spoken to. This larger theme, played out in the characters background, also informs the plot. 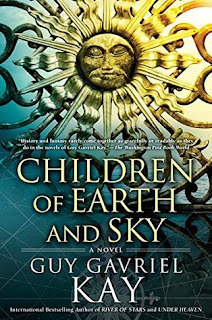 No spoilers, as ever, but the stakes are high, and De Castell blends a crackling, action packed set of events with an exploration of humanity with great skill. He’s also got an exceptional ear for dialogue – the back and forth between our heroes is always a delight, and it helps that in between being witty, they have time to be genuine, and aren’t afraid to be complicated people too. This is a book with interesting things to say, and it says them through intriguing characters, and a plot which kept me hanging on to every single word. Is it worth reading? If you come to it without reading the first two, it will suffer, I think – it needs the context of the series to really work at full strength. 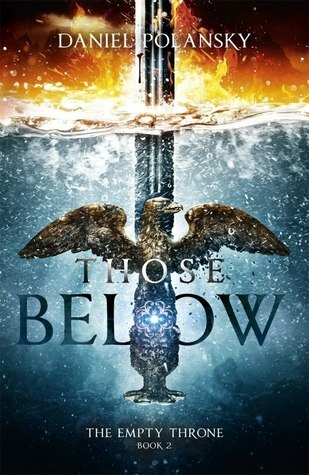 As the third of a series, though, it’s a powerful piece of narrative, recommended without reservation.